What is this course all about? CSD certification in New Delhi has gained popularity and there are several mediums to take up CSD training in New Delhi. KnowledgeHut provides certified scrum developer training in New Delhi which is a boon for those looking to streamline their skills to create quality software. 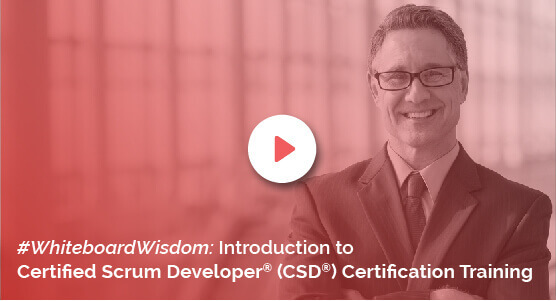 The CSD certification in New Delhi aims at imparting the fundamentals of Scrum and set up standards and best practices for quality software creation. The course is designed to help individuals benefit from the collaboration of cross functional teams. Benefits of the course One can learn about the essence of Agile, scrum framework, principles, roles and ceremonies necessary to work in scrum environment and much more by taking up the CSD training in New Delhi. The course also includes activities such as innovative games with Scrum, coding practices and multiple TDD (test driven development) examples using .Net and Java. The KnowledgeHut Way KnowledgeHut provides downloadable e-book in addition to the Scrum alliance approved course material provided during the 5 day classroom training. Allowing access to everyone who has enrolled for the CSD course in New Delhi, the candidate can enroll and attend the sessions of lecturers and tutors who are backed by several years of practical and qualified experience.